Holy mackerel, Batman! Mackerel recipes to try at home. 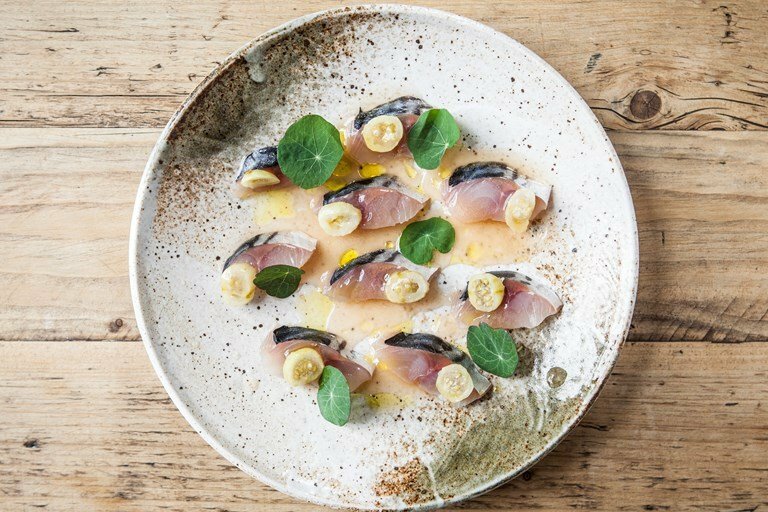 To celebrate the start of Seafood Week (5-12 October) we’ve got a selection of delicious mackerel recipes for you to enjoy. Our level of difficulty rating is completely tongue in cheek, based on Mrs. Otter Vale’s culinary skills – she loves eating, but leaves the cooking to Granny and Mr. Otter Vale! Mackerel is a fish which can be cooked in a number of ways, which makes it interesting to both home cooks and chefs. It’s often paired with sweet and acidic flavours to complement the oily, strong flavour, such as beetroot, gooseberry, chilli, tangy tomato and even lemon sherbet! 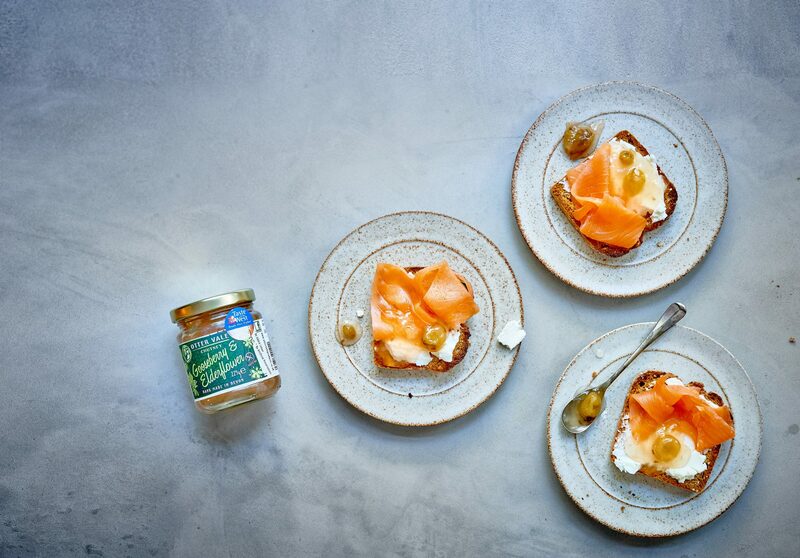 We love it with our refreshing Otter Vale Gooseberry & Elderflower Chutney, which also pairs beautifully with goat’s cheese, as well as smoked salmon on toast! Remember, you can find out more information about mackerel and sustainable fish choices here. 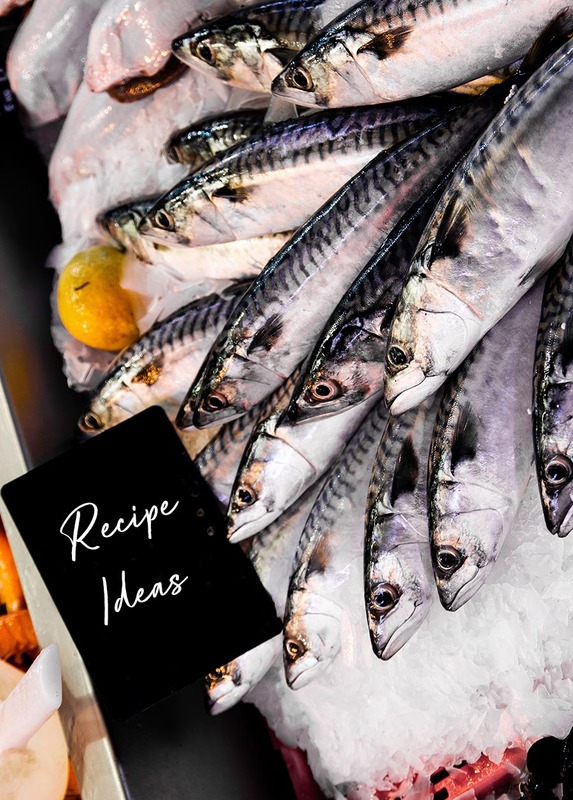 You can also read our interview with local fishmonger James England from Greendale Farm Shop and watch a video of him demonstrating how to prepare mackerel for cooking here. Otterly quick, otterly simple: Mrs. Otter Vale can do tea and toast, so these should be manageable. Otterly doable: Mrs. Otter Vale begins to break a sweat; Mr. Otter Vale rolls his eyes and rolls up his sleeves. Otterly special, otterly delicious: Mr. Otter Vale is in his element; fancying himself a bit. But he still might call his mum, just to check! Difficulty level: Otterly quick, otterly simple! 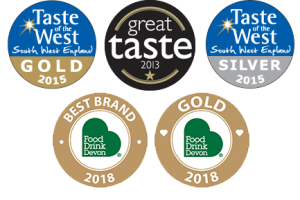 If you’d prefer to buy your smoked mackerel pâté, we recommend popping in to Greendale farm shop and picking up some the fishmongers have prepared. Whilst you’re there, pick up some delicious bread of your choice and a jar of Otter Vale Gooseberry & Elderflower Chutney. Simply spread the pâté on the bread, put a dollop of chutney on top and enjoy! Remove skin and bones from the smoked mackerel fillets. Place the flesh in a food processor and blitz for 2 minutes. Add the cream cheese, crème fraiche and blitz for a further minute until you have a smooth paste. Add the lemon juice, peppercorns and salt to taste, blending to ensure it’s thoroughly mixed. Serve on fresh crunchy bread and enjoy. Your pate can be stored in the fridge for up to 3 days. 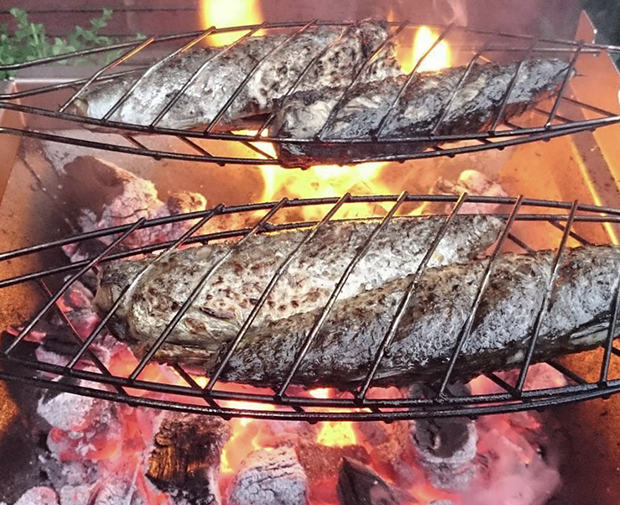 Mackerel does well cooked on the barbecue, particularly if you start with a clean grill and a well-oiled fish. Cooking it whole (but gutted) makes it less likely that you’ll overcook it too. You’ll know it’s ready when the eyes turn milky and the skin is easy to remove. At this stage, the meat will flake and retain its moisture. One fish per person is usually enough, depending on huger levels and accompaniments! Serve with accompaniments of your choice. We like a celeriac mash in September, and seasonal vegetables at other times; accompanied by our Gooseberry & Elderflower Chutney. However, we have another treat in store for you. We are honoured to share with you a recipe from our friend Sue Stoneman. Sue needs no introduction if you’re no novice on the Devon foodie scene, but just in case you’re not from round ‘ere, Sue was South West Chef of the Year‘s winner of the Home Cook in 2016 and 2017, has been West Country Baking Champion, Sticky Toffee Pudding Champion, AND is a food writer, and a blogger with Dining Devon. She also is renowned as somewhat of an expert on al fresco cooking, both on BBQs and in her own wood-fired oven, and is in demand as a demonstrator throughout the region. Oh, and she also has a day job at Big Fire, at The Shops @ Dartington! Three things we love about Sue – she is a strong supporter of local produce, has some great scarves and is just the loveliest person. So, let’s find out Sue’s Secrets when it comes to cooking mackerel. You can’t beat freshly caught fish grilled over coals, simply seasoned and served on their own or with your favourite sides. 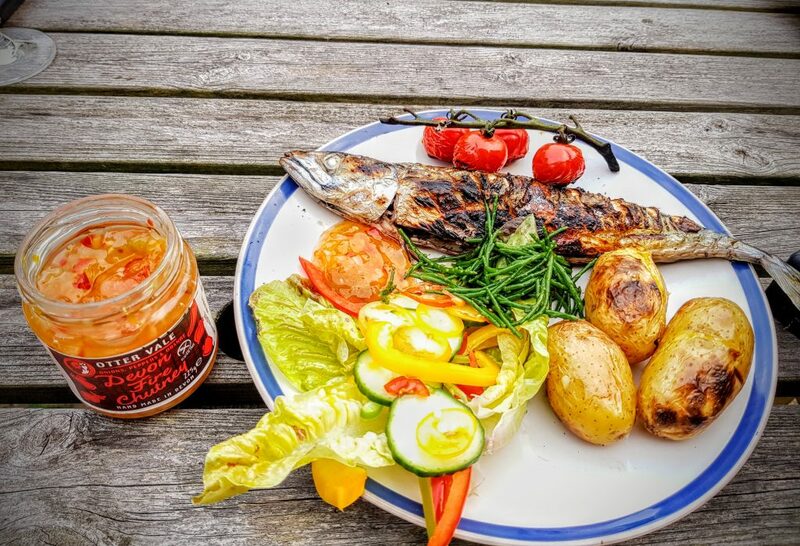 Mr. S. and I love our BBQ’d mackerel with some little baked potatoes, cherry tomatoes, salad and a large dollop of Otter Vale’s Devon Fire Chutney which we always have a jar of in the fridge. Gut the fish, (we prefer to keep the heads on). Wash and pat dry with kitchen paper. If you’re not keen on gutting, ask your fishmonger to do it for you. Boil 6-8 potatoes til just tender. Put on skewers and drizzle with olive oil and sprinkle with salt and pepper. Oil your BBQ grill. This will prevent the fish from sticking. Place the grill over the coals and get it nice and hot. 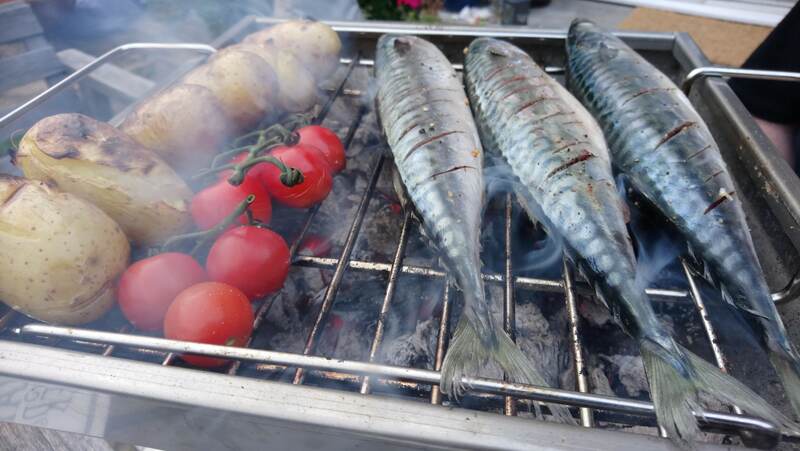 Place the mackerel and the skewered potatoes on the BBQ. When you see the skin start to crispen up, it’s time to carefully turn them over. Cook for another few minutes. The length of time to cook your fish will depend on how big they are. They will not take very long. Serve hot with the potatoes, salad and of course a large dollop of Devon Fire Chutney. Michael Bremner’s recipe is available from Great British Chefs. It serves 4, and should take about 1h 15mins to make – once you’ve fermented the gooseberries for 7 days! So, if you want to make this in a bit of a hurry, we suggest substituting our Gooseberry & Elderflower Chutney – you’ll lose the chilli taste, but it’ll suddenly be quick and easy! We hope you try and enjoy some of these recipes, and we’d love to know what you think!